The Mt. 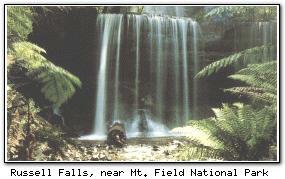 Field National Park is approximately an hour's drive past New Norfolk out of Hobart. Close to the park entrance are three waterfalls: Junee Falls, Marriotts Falls, and the most popular and well-known Russell Falls (below). The park itself is one of the prime habitats of the Tasmanian Devil. Some of the eucalypt trees in the park are over 400 years old, 90 metres high and 20 metres around the base. Mount Mawson, west of Lake Dobson, is the state's best skifield behind Ben Lomond. It is covered for approximately four months of each year, and chains will be needed. Within the park are Horseshoe and Lady Barron Falls, accessible by a short walk. Mt. Field National Park covers an area of 16,265 ha. and was the state's first National Park, so designated in 1916. Mount Field has one youth hostel, but otherwise accommodation is limited.